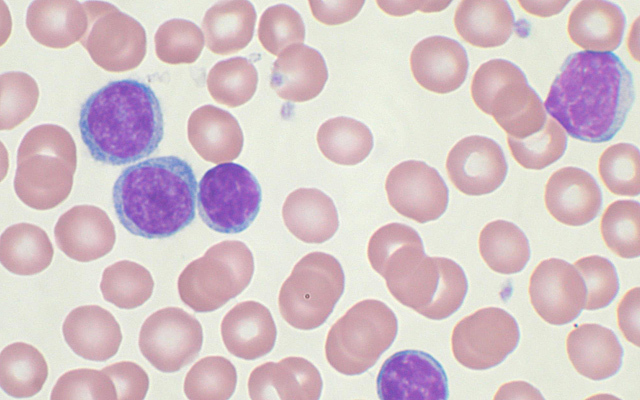 Stained chronic lymphocytic leukemia cells. Building upon previous research, scientists at University of California, San Diego School of Medicine and UC San Diego Moores Cancer report that a protein called Wnt5a acts on a pair of tumor-surface proteins, called ROR1 and ROR2, to accelerate the proliferation and spread of chronic lymphocytic leukemia (CLL) cells, the most common form of blood cancer in adults. They note, however, that these effects of Wnt5a were blocked by a humanized monoclonal antibody specific for ROR1, called cirmtuzumab (or UC-961), which inhibited the growth and spread of CLL cells in both cell lines and mouse models of leukemia. The findings are published in the December 21, 2015 issue of The Journal of Clinical Investigation. Although the findings are made with leukemia cells, researchers said the study has implications for patients with other cancers, including solid-tissue tumors. ROR1 and ROR2 are considered “orphan receptors,” which are expressed primarily during embryonic development. The expression of these proteins, particularly ROR1, becomes suppressed during fetal development and is negligible on normal adult tissues. However, CLL and many solid tissue cancers re-express these orphan receptors. “Our findings show that ROR1 and ROR2 team up to stimulate tumor cell growth and metastasis in response to Wnt5a, which appears over-expressed in patients with CLL and can act as a survival/growth factor for leukemia cells. By blocking the capacity of Wnt5a to stimulate tumor cells, cirmtuzumab can inhibit the growth and spread of cancer cells,” said senior author Thomas J. Kipps, MD, PhD, Evelyn and Edwin Tasch Chair in Cancer Research and deputy director for research at Moores Cancer Center. In 2008, they reported that patients vaccinated with their own leukemia cells could make antibodies against ROR1, some of which had the ability to reduce the survival of leukemia cells. They found ROR1 on leukemia cells but not on all normal adult tissues examined. In 2012, they reported finding ROR1 on many different types of cancer, particularly cancers that appear less differentiated and more likely to spread to other parts in the body. Because this protein was not found on normal adult tissues, these findings made ROR1 a new target for anti-cancer drug research. In June 2013, they linked ROR1 to a process used in early development, suggesting cancer cells hijack an embryological process – called epithelial-mesenchymal transition – to spread or metastasize more quickly. In January 2014, they reported expression of ROR1 resulted in a faster-developing, more aggressive form of CLL in mice. In September 2014, they launched a phase 1 human clinical trial of a new monoclonal antibody for patients with CLL. The drug, called cirmtuzumab, targets ROR1 in cancer cells in general and cancer stem cells in particular. The safety trial is on-going. In November 2014, they described cellular experiments indicating cirmtuzumab might also be effective against cancer stem cells, which appear responsible for the relapse and spread of cancer after conventional therapy. The latest research more precisely defines the critical roles of ROR1 and ROR2 in cancer development. Both are evolutionarily conserved proteins, found in many species, and most active in the early stages of embryogenesis, when cells are migrating to form organs and parts of the body. The lack of either during this process results in severe developmental abnormalities. Low levels of ROR2 remain in some adult tissues, but ROR1 is found only in cancer cells. Researchers found that in response to signaling by Wnt5a, ROR1 and ROR2 come together to signal the growth and migration of cancer cells. Such migration contributes to the spread of cancer to cause metastasis, which is responsible for 90 percent of cancer-related deaths. But treating mice with cirmtuzumab disrupted the process, inhibiting engraftment of leukemia cells and slowing or stopping the disease from spreading. Co-authors include Jian Yu, Liguang Chen, Bing Cui, George F. Widhopf II, Zhouxin Shen, Rongrong Wu, Ling Zhang and Suping Zhang, all at UC San Diego Moores Cancer Center; and Steven P. Briggs, UC San Diego. Funding for this research came, in part, from the California Institute for Regenerative Medicine (grant DR3-06924), the UC San Diego Foundation Blood Cancer Research Fund, the Leukemia and Lymphoma Society (SPORE grant 7005-14) and the National Institutes of Health (5P01CA081534-14 to the CLL Research Consortium).